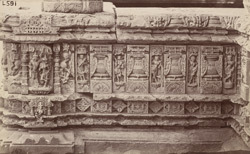 Photograph of the mouldings and the sculptural details on an unidentified temple at Aihole, taken by Henry Cousens in the 1880s. Aihole was one of the capitals and an important commercial centre of the Early Western Chalukya, a powerful dynasty which ruled the Deccan from the 6th century. Similar to the two other Chalukyan capitals, Badami and Pattadakal, there are many Hindu and Jain temples preserved at Aihole which belong to a period that spans the 6th to the 12th centuries, encompassing the Early and Late Chalukya periods and the Rashtrakuta era. They are situated both inside and outside the walls that enclose the site and they have varied forms that show different architectural influences. The carvings on the unidentified temple in this view consists of purna-ghatas, vases with overflowing foliage, small female figures situated in niches between them, semi-lotuses and geometric motifs along the deeply cut mouldings.